FANBOY PLANET.com . : mc-spotlight110106 :. In the midst of Civil War, the Hulk's world is upside down. Rather, it's not his world at all, as he's been sent to another plant as a result of the machinations of the so-called thinkers of the Marvel Universe. Readers, too, will see their expectations upended, as writer Greg Pak opens this issue with a three panel summation of the "Planet Hulk" epic done for children. It's a puppet show, but that's not what will be startling to the casual reader. It's that the puppeteer is a member of the Brood, a genocidal race of insectoids. Then it's back to action. The Hulk has been a slave, a gladiator and a warrior. In all of it, as the Brood member says slyly (or not - it's hard to tell with all those teeth), he was a bigger monster than any of them. Now he leads a rebellion against this planet's Red King, uniting disparate slave races. But is he really their savior? That question lies at the heart of Pak's main tale, detailedly delineated by Pagulayan (in a career-making run) and Huet. Action does dominate the tale; it is, after all, the 100th issue of the Hulk. But underneath it all lies questions of faith and destiny. There's also loss. If you get sucked into this issue, you'll find yourself more moved by death here than in Civil War, and that book has characters we've known for years. Here Pak lets them inhabit more than plot points; we understand their motivations. One line alone evokes empathy for a Stone Man from Saturn. How did that happen? Perhaps on one level, this creative team had little to prove. By taking Hulk out of the bombast of the big cross-over event (and thus naturally sparking the next one), they could take their time carving out a corner of their own. Which they have. It's been said elsewhere, but it bears repeating: this is one of the best Hulk stories ever. I'm a huge fan of Peter David's run, and the two writers may be apples and oranges in their intent - this is one good orange. And it's not just Pak. The art team here captures monstrousness, yet the sadness of the alien armored Miek is palpable through the drawing, not the caption. That alone would make this a great book, but Pak also teams with Gary Frank and Jonathan Sibal for a back-up story with the awkwardly named Mastermind Excello. This character debuted in Amazing Fantasy, created by Pak for just such an emergency. You want to know what's going to happen with World War Hulk? It starts here. Quietly. Urgently. Brilliantly. And it also makes Reed Richards' participation in the Civil War just a little bit more believable. Marvel also throws in reprints that underscore the themes in Pak's stories. Not only does the publisher give us fun, we get depth. At $3.99, this is one heck of a great buy. 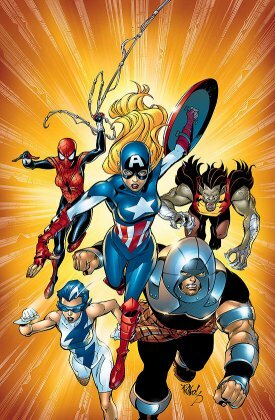 Avengers Next #1: This future Marvel just will not die. It's lightweight and honestly forgettable but built around cool characters. Tom DeFalco writes it old-school, and if all you're looking for is fun, you could do worse. It's just hard to be invested in these Avengers - maybe because with Marvel Adventures Avengers and Ultimates and New Avengers, we've got plenty for every taste. Beyond! #5: At the risk of revealing a spoiler, I have to ask - are Hank and Jan really just now getting around to seriously dealing with the domestic violence in their past? If so, this seems like an odd book to place that confrontation, but then, almost everything about this series has been just a little bit odd. It's fun in its own strange way, just as Secret Wars was in hindsight, but despite good writing from Dwayne McDuffie and above average work from Scott Kolins, it lacks any sense that it's going to mean anything. Criminal #2: To steal from an acting cliché, Ed Brubaker could write about a guy reading the phone book aloud and it just might be a hell of a book. Luckily, that's not what he's writing about. Instead, he's part of a small cadre of creators reviving the straightforward crime book, and this offering from Marvel's Icon imprint is tense, cool, and great. In addition to having a handle on noir (with able help from Sean Phillips), Brubaker also gives us a rundown on a classic film of the genre. See? You can be entertained and educated. The Irredeemable Ant-Man #2: This makes the first book from Robert Kirkman's Marvel career that feels like Kirkman's career everywhere else. It's got his unique voice, it's irreverent and most importantly, it's intriguing. Phil Hester and Ande Parks provide art that fits pretty well, though they seem to be trying something with foreshadowing that overplays a couple of moments. It could be a production error. What isn't an error is creating this strange anti-hero in an old hero's name. Red Prophet #3: This Dabel Brothers effort faithfully adapts one of Orson Scott Card's most beloved novels. It's competently adapted and drawn, and moreso than some of the studio's earlier efforts, but therein lies the problem: it doesn't offer us anything more. As I read it, I flashed back to my memories of Card's original prose, and yes, it was pretty much the way I'd pictured it - except perhaps a little more mundane. The back cover by John Buxton offers something visionary; Renato Arlem's work feels slightly stiff and over-inked. The novel offers wonders; the comic offers an adaptation of same. 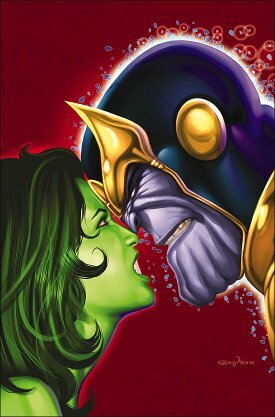 She-Hulk #13: Let me hand it to Dan Slott; he's followed up on his most heavily criticized She-Hulk storyline and worked hard to burnish its reputation. It works, though it also feels a little pat. The stakes had raised so high that it's hard to come up with a denouement that would satisfy everyone, and Slott's not quite through yet. Spider-Man/Power Pack #1: For a bunch of kid heroes that shouldn't be fighting crime anyway, the Powers sure get in a lot of trouble. Though these stories aren't particularly insulting to adult readers, Marc Sumerak writes with kids in mind, and for them, Power Pack is a good idea. The inclusion of a Mini-Marvels tale at the end is funny, but not necessarily appropriate as it references events in Civil War, which are definitely NOT for children. The Guiding Light cross-over also fills the last couple of pages, which might not be the best thing for young readers. We're trying to hook them on one kind of serial drama; maybe we should keep them away from the soaps. Uncanny X-Men #480: Vulcan trashes the Shi'ar Imperial Guard. Ed Brubaker writes it. See phone book comment above. X-Men: Phoenix: Warsong #3: Greg Pak found a way of reviving the Phoenix concept without trashing the memory of Jean Grey. For good measure, he proved once again that Scott Summers just can't love a woman if she's not capable of wiping out the human race. If it's better than it should be, it's because Pak is a subtly humanistic writer, picking up the threads of Grant Morrison's work on New X-Men and somehow bringing it all back down to a human level. Doll and Creature: Everything Turns Gray: This trade paperback collects a nifty little mini-series from Image that's straight out of that monstrous strange brain of Ric Remender. Do yourself a favor and read this combo of Blade Runner with Frankenstein. Midnighter #1: Grant Morrison writes Batman and now tackles Wildstorm's Super-Batman. It should be one heck of a great ride.